As you sift through the nearly endless mass of wedding imagery available on the (let’s be honest here) ludicrous number of wedding expert sites floating around, you’re probably encountering all sorts of new terms and ideas. This can be pretty fun; you can find different ways to commemorate your celebration that suit your personalities and ideals, along with sweet ways to manage the the days leading up to your celebration. Over the next few weeks I’ll share my experience with special touches that worked incredibly well, and some of the things that flopped hard. Unity ceremonies, bouquet tosses, first looks, cake cutting (and eating), booze, rehearsal dinners, thunderstorms, elopements, and hundreds of guest affairs… I’ll be repackaging my experiences in the form of some wedding advice for you. Let’s dive in with the departure. If you don’t know what I’m talking about, go google “sparkler exit.” Over the past few years it’s become the style to have the newly married couple race through an aisle lined on each side with wedding guests. The guests are all the friends and relatives who’ve managed to hang around for the whole reception (more often than not drinking)... and someone, somewhere along the way thought it’d be a great idea to give them all fire. Don’t get me wrong- sparklers are beautiful. They cast a cool light, everyone smiles when they see them, and the tradition of fireworks here in the USA goes back a ways- I don’t have anything against them. But it’s really special when a couple opts to personalize the end of the reception. Here are some inspired ideas! Anna & Trey got married at a beautiful barn wedding in Murphy, NC (@Mcguires). Part of the theme of the day involved the fact that Trey is a pilot, so the groom’s cake and wedding favors were themed that way, as was was their departure. They opted to let wedding guests throw Styrofoam planes over their heads as they ran out to their waiting car. And while it could’ve gone either way, this one was definitely a visual success, and (bonus) their guests loved it! Who doesn’t like playing with light up rings and sticks?! Plus, they last so long you can bring them out on the dance floor an hour or more before you head to your departure. For this wedding, the guests enjoyed dancing with their glow sticks and I was able to capture some super-fun images! When we all went out to line up for the departure with glow sticks in hand, it was a GREAT way to transition from the reception to the after-party with no flames (or smoke) involved. Bubbles can be beautiful, but they can also be a little messy. These are best suited for outdoor departures during the daylight-but if it’s a windy day, don’t count on the magical floating Disney effect… instead it turns into little soapy spatter. If it’s windy, ditch the bubbles and just go for a bunch of loud cheering and jazz hands! Rice is completely out, but birdseed provides much of the same effect and it opens up the environmental happiness by feeding the critters after the party has moved on! This is a nice one, and it can photograph well, but only in quantity-so make sure you’ve got plenty. Oh, and avoid sunflower seeds here, as those tend to just look like flies in photographs. Birdseed is a solid choice for a daylight exit, and not as susceptible to wind as the bubbles. Lavender or rose petals are GREAT; I wish they were more commonly used in the US. They float well in wind, look good in daylight or low light settings, are easy to clean up, and don’t hurt if they hit you in the face. Natasha and Matt didn’t want to go the sparkler route, so they used petals from the bouquets to mark the move from reception to after-party! Caveat- any time you give someone something to throw at you, you’re opening yourself up for potential problems (which is why I never recommend birdseed… that stuff stings). If you’re going to let your guests chuck stuff at you, the rule of thumb is that softer is better. Set it up with your venue ahead of time if the departure is indoors like this one, so you know who’s responsible for cleanup! Here’s an interesting story: one of my recent weddings wasn’t going to do a departure at all, but I talked them into it right at the end of the evening. Instead of just turning off the music and heading home, we lined up two rows of all the remaining guests at the end of the night and had them give a huggy, high-five filled, LOUD woo-hoo sort of send off to the couple. This may have resulted in one of my favorite departures ever. The hugs and tears and laughter gave us all a beautiful end to a wonderful day, and it just didn’t feel too abrupt like it often does when there’s no departure. 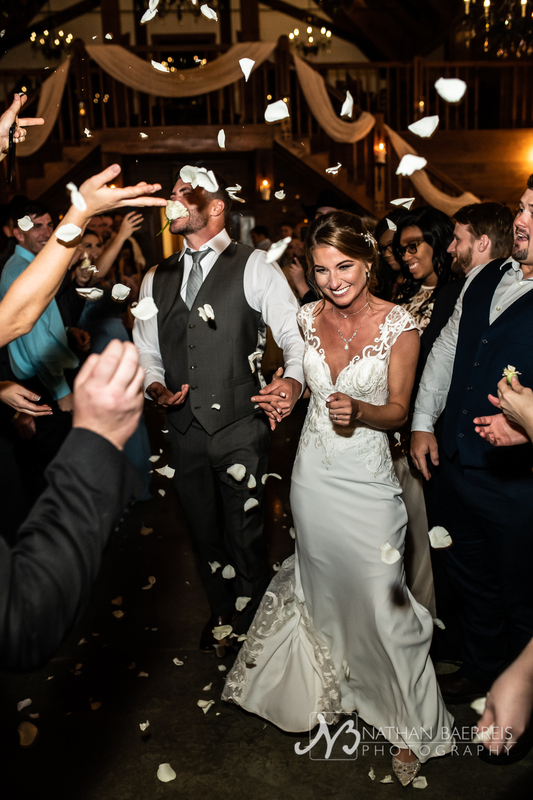 I am a big fan of transitions, and a group event (like the departure, or when everyone stands as the couple comes down the aisle) is a good way to mark the transition from one phase of the day to the next. It doesn’t have to be fancy, or gimmicky, or end with you peeling out of the parking lot in a million dollar supercar - it can be just you and your friends saying “see you at the house” or whatever…and it will still be beautiful! Paper lanterns are cool. Everyone loves them, but they may not be legal where you’re having your ceremony- check with the local fire department. One caution I can share as a photographer: they’re neat in person but they’re difficult to photograph because of the timing (the lanterns all get launched at different times, so it’s more like a trail than a flock, if that makes sense). But they’re super cool! with a little space and sobriety, these are still lovely!